A clueless little dodo stumbles into several adventures. Dodo is excited to be with his mother on a special walk with a surprise destination, and he is ready for anything. He sings as he goes, waking some baby birds. The funny-shaped rocks he collects include an egg that breaks and a turtle, shell and all. He is friend to all until he encounters a skunk who is definitely not interested. He scares himself when he mistakes a totally different bird for his mama. Finally, his mother shows him a place that overlooks a wide-open expanse filled with color and beauty. On the long walk home, Dodo is happy but exhausted, and he finds comfort and reassurance as he sleeps cradled in mother’s soft feathers. Dodo is sweet and clumsy, filled with good intentions and wide-eyed innocence in his best of all possible worlds. 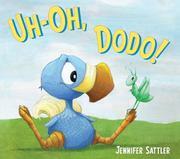 Sattler employs the sparest of text and repeats the title phrase, “Uh-Oh, Dodo,” after every misadventure. Acrylic-and–colored-pencil illustrations depict a bright, lush landscape filled with exotic flora and fauna. Grasshopper is a lovely surprise character, a very loyal friend and companion who accompanies and helps Dodo at every step of the journey but is never mentioned in the text.